^ 2.0 2.1 2.2 2.3 2.4 2.5 Faculty of Catholic University of America (编). Vatican Council II. New Catholic Encyclopedia XIV 1. New York: McGraw-Hill: 563. 1967. OCLC 34184550. ^ Sullivan, Maureen. 101 Questions and Answers on Vatican II. New York: Paulist Press. 2002: 21. ISBN 0809141337. ^ Bokenkotter, Thomas. A Concise History of the Catholic Church. New York: Image. 2005: 413. ISBN 0385516134. ^ 6.0 6.1 6.2 6.3 Faculty of Catholic University of America (编). Vatican Council II. New Catholic Encyclopedia XIV. New York: McGraw-Hill: 565–566. 1967. OCLC 34184550. ^ Faculty of Catholic University of America (编). Vatican Council II. New Catholic Encyclopedia XIV. New York: McGraw-Hill: 564–565. 1967. OCLC 34184550. ^ 8.00 8.01 8.02 8.03 8.04 8.05 8.06 8.07 8.08 8.09 8.10 8.11 8.12 8.13 8.14 Faculty of Catholic University of America (编). 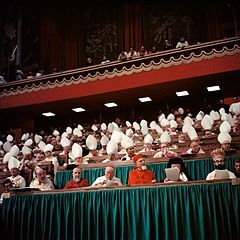 Vatican Council II. New Catholic Encyclopedia XIV. New York: McGraw-Hill: 566–567. 1967. OCLC 34184550. ^ 9.0 9.1 9.2 9.3 9.4 9.5 9.6 Faculty of Catholic University of America (编). Vatican Council II. New Catholic Encyclopedia XIV. New York: McGraw-Hill: 567–568. 1967. OCLC 34184550.
van Bühren, Ralf. Kunst und Kirche im 20. Jahrhundert. Die Rezeption des Zweiten Vatikanischen Konzils. Paderborn: Schöningh. 2008. ISBN 9783506763884 （德语）. Bredeck, Michael. Das Zweite Vatikanum als Konzil des Aggiornamento: zur hermeneutischen Grundlegung einer theologischen Konzilsinterpretation. Paderborn: Schöningh. 2007. ISBN 9783506763174 （德语）. Linden, Ian. Global Catholicism: diversity and change since Vatican II. 41 Great Russell St, London: Hurst and Co. 2009: 337. ISBN 9781850659570 （英语）. Pope Paul VI. Pastoral Constitution On The Church In The Modern World - Gaudium et Spes. Vantican City: Holy See. 1965-12-07 [2009-01-01] （英语）. Pope Paul VI. Constitutio Pastoralis De Ecclesia In Mundo Huius Temporis - Gaudium Et Spes. Vantican City: Holy See. 1965-12-07 [2009-01-01] （拉丁语）. Pope Paul VI. Dogmatic Constitution On Divine Revelation - Dei Verbum. Vantican City: Holy See. 1965-11-18 [2009-01-01] （英语）. Pope Paul VI. Constitutio Dogmatica De Divina Revelatione - Dei Verbum. Vantican City: Holy See. 1965-11-18 [2009-01-01] （拉丁语）. Pope Paul VI. Dogmatic Constitution On The Church - Lumen Gentium. Vantican City: Holy See. 1964-11-21 [2009-01-01] （英语）. Pope Paul VI. Constitutio Dogmatica De Ecclesia - Lumen Gentium. Vantican City: Holy See. 1964-11-21 [2009-01-01] （拉丁语）. Pope Paul VI. Constitution on the sacred liturgy - Sacrosanctum Concilium. Vantican City: Holy See. 1964-11-21 [2009-01-01] （英语）. Pope Paul VI. Constitutio De Sacra Liturgia - Sacrosanctum Concilium. Vantican City: Holy See. 1964-11-21 [2009-01-01] （拉丁语）. This page is based on the Wikipedia article 第二次梵蒂岡大公會議; it is used under the Creative Commons Attribution-ShareAlike 3.0 Unported License (CC-BY-SA). You may redistribute it, verbatim or modified, providing that you comply with the terms of the CC-BY-SA.